Research from business messaging experts Commify shows that 64% of businesses considering using SMS to communicate with customers or staff are trying it for the first time. 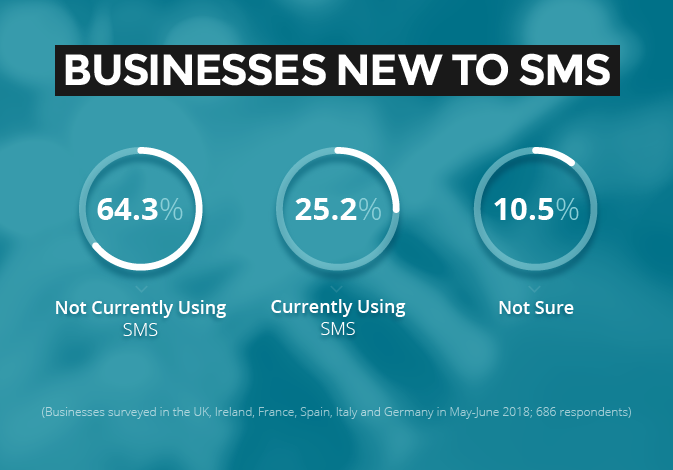 The firm surveyed over 1,000 European businesses and asked them if they were already using SMS, a technology which has been around for over a quarter of a century. Nearly two thirds of those that responded were looking to employ the communications channel for the first time. There are currently many different messaging choices for businesses, however none of them have the reach of SMS. This is one of the reasons for its popularity and continued take up. Even though messaging platforms such as WhatsApp, Facebook Messenger and WeChat have billions of monthly active users, SMS continues to show extraordinary resilience as a service for inter-person and business messaging. The survey, undertaken by Commify, polled all visitors – existing customers and new prospects – to its brands’ websites. They were asked whether they were currently using SMS, or if they were existing customers, whether they had used SMS prior to working with a Commify brand. Of the new prospects surveyed, 64.3% were not currently using SMS. While 63.6% of existing customers had not previously used SMS. Commify is the leader in the business messaging space in Europe, with almost 35,000 businesses using its services to send almost 3 billion messages a year. The company is expanding quickly in this growing market and has acquired five European messaging companies so far in 2018. Goyya Systems, trading as Massenversand.de, in Germany and SMSUP in Spain were acquired recently and three UK-based messaging companies, Fastsms, Connection Software and M:Science, were acquired earlier in the year.